Demco Interiors worked with Kent County Council on the design and installation of the interior of the new build flagship Kent History and Library Centre. The Centre has now opened its doors to the public to much acclaim for its innovative design and contemporary interior. The library will stock over 40,000 books and includes a children's library, a history centre circular hub and a small pop-up retail shop. Kent has a wealth of county history documents, photographs, maps and records. To make sure they survive for future generations they need to be kept in carefully controlled conditions. The new History and Library Centre has been purpose built to protect and display more archives and increase public access. Through a series of co-creation workshops with the library team, Demco produced conceptual 3D visualisations of products that would add a different perspective to the open plan interior. Special features include an innovative seating hub where visitors can sit and view the historical graphic timeline, and in the children’s area there is a mini amphitheatre with a scribble wall. Book and multi media stock is housed on Demco’s white Promo shelving (with guiding in the Council red corporate colour) both in the children's and adult section. 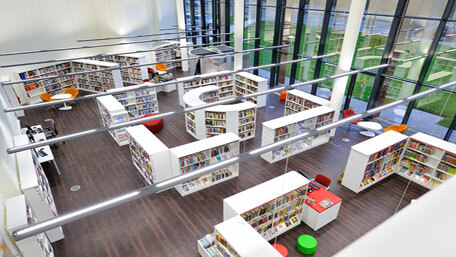 The stark white of the shelving creates a striking contrast to the dark woodstained floor and gleaming architectural aluminium open ducting and end to end building glazing. The shelving has been designed for maximum stock display with modern pigeonhole features to promote and highlight individual items. The new library and archives facility will replace and update the existing services currently offered at the Centre for Kentish Studies, County Central and St Faith's libraries. "It was a significant challenge to get the amount of shelving needed for all the stock and allow space for furniture and circulation, but the finished result more than exceeds our expectations. "The excellent design really complements the building and throughout the project Demco had a good eye for detail. In the Kent History and Library Centre we have a building we can all be proud of." Full press release and more images on the Demco website.